Skiers, snowboarders and ski tours need a great set of gear that includes skis, ski boots and ski poles. Since the winter equipment for skiers differs from equipment for ski touring, winter equipment and ski touring equipment are separated in the following checklist, although some pieces of equipment are used for both. Well ventilated ski helmets, e.g. 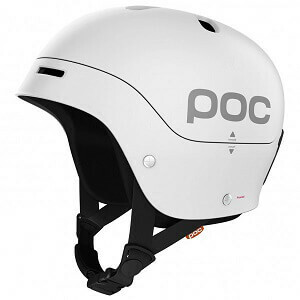 by POC, are warm and mean you don't need a beanie underneath. Lightweight and comfortable helmets are available for all adult and kids head sizes. With various straps and pads, they can be individually adapted to your own head and protect you from dangerous head injuries. 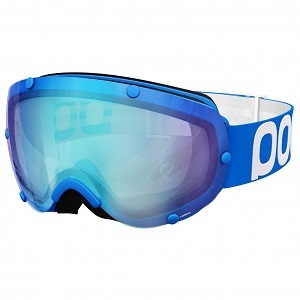 Matching snow goggles, e.g. by Uvex, can be attached directly to a ski helmet. The protect the eyes from wind, strong UV radiation and snow flurries, so you have clear vision even in the worst conditions. The lenses are available in various versions - from brightening with strong contrast in fog and poor visibility to extreme darkening for glaciers and strong brightness. Drinks, snacks and important accessories are all carried in the ski rucksack and add hardly any weight. 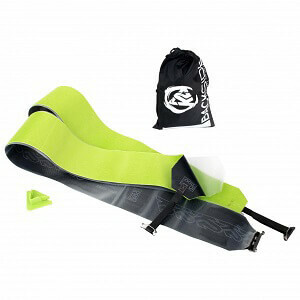 The matching ski bags and ski boot bags are perfect for carrying skis and ski boots. They protect the valuable gear from damage and scratches when travelling. Well dried, cleaned and oiled, the material can be stored in practical ski bags to be protected from dust during the summer for the next winter season. For some, ski wax from a tube is enough, whilst others need a complete brush set and a selection of different wax types for different snow temperatures. How much time you want invest in the care and tuning of surfaces and edges is up to you. However, if you devote a lot of time and dedication, you'll be rewarded with optimal gliding and a first-class ride. Downhill skiers don't need to worry about crampons. They help freestyle riders and freeriders overcome difficult passages, in order to safely reach dreamy deep snow slopes. Regular skiers won't need ice climbing or mountaineering gear when skiing. When ski mountaineering or ski touring, which includes climbing and abseiling passages, climbing harnesses, climbing ropes, carabiners, belay devices and ice tools or ice axes may be necessary. Warm and weatherproof winter jackets and winter trousers are perfect for skiing, just like thermal undergarments and down gloves. And after skiing, winter boots, merino undergarments, winter hats and down coats provide warmth and comfort. Warm winter sleeping bags are perfect for huts and camping in winter. Ski touring backpacks have plenty of space for an avalanche beacon, hydration bladder, spare clothes and snacks. Countless attachments and compartments allow them to be carried comfortably and sit firmly on the back even when travelling quickly. Ski skins provide the required grip on the ascent when ski touring. The glue skins are peeled off at the summit so nothing gets in the way of a speedy descent. In ski touring backpacks, there are usually extra compartments for avalanche shovels and avalanche probes. In an emergency, both are then immediately available and can be used to rescue buried companions. No skier should be in the back country or on ski tours without an avalanche transceiver or beacon. The small transmitter allows rescue teams to locate your exact position in case you've been buried by an avalanche. In case other skiers have been buried, it can be used to locate them. In the event of an avalanche, avalanche airbags help keep the skier on the surface. The system, which is integrated in special avalanche airbags e.g. by ABS, is one of the best possible protection measures for off-slope powder runs. Ski touring boots are optimised for the relevant pin or frame bindings for ski tours and offer not only optimal support but also very good comfort during ascent and descent. Head torches with a large range and high brightness are perfect for ski touring. Good moisture protection and a long battery life are also an advantage. Good ventilation is important for ski tour clothing. Breathable and waterproof materials are just as important as practical ventilation openings for ski touring jackets and ski touring trousers. Sporty ski undergarments or merino or synthetic fibre thermal underwear ensures perfect comfort. Whether as an aid for back country skiing and snowboarding, or for pure winter fun snowshoeing, both are available for alpine use and for sporty winter walks. The type of clothing for snowshoes depends on the ambitions of the walker. For activities in the mountains, similar clothing for ski touring is recommended, which should be well-ventilated. For moderate use, normal winter clothing is ideal.